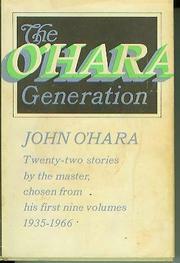 A rewarding three-decade retrospective of representative short stories (22) previously published in other collections, which points up changing relevancies of O'Hara's times. The shuttered portents of Eastern small town secrets, seen from down the road or over the tracks, give way, as O'Hara's generation moves on into the postwar period, to plate-glassed masques after old structures have crumpled and familiar landscapes withered. The early stories probe distant or immediate but specific tragedies--elderly parents bereft by a child's suicide; the retrenchment of an aging film star; the remnants of old-family eminence which love had not sustained. In the later stories the characters talk more in a rootless, claustrophobic clash. The dialogue veers unerringly toward poles of loneliness and the small indulgences of self-pity. In the later stories, place, the passing of time, the consciousness of self has lost its village green sureness, giving way to a nebulous attachment to a rearguard ethos. More than any other writer O'Hara has intuited the poignancy of this American disengagement.